Massachusetts data indicate that even if 90 percent of health insurance costs were subsidized, 25 percent of those eligible for subsidies would choose to remain uninsured. In 2006, Massachusetts enacted Commonwealth Care, a program similar in many ways to the Affordable Care Act in that it subsidized health insurance for low-income adults. 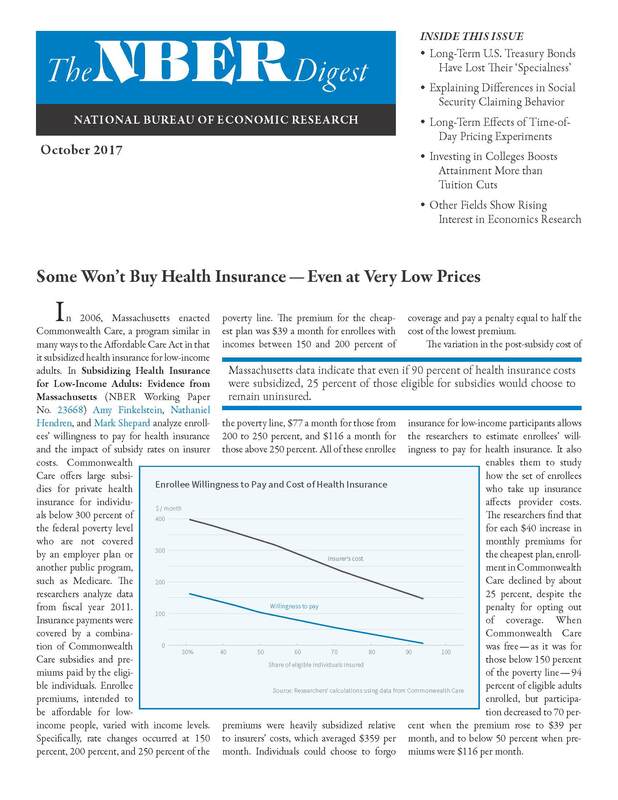 In Subsidizing Health Insurance for Low-Income Adults: Evidence from Massachusetts (NBER Working Paper No. 23668) Amy Finkelstein, Nathaniel Hendren, and Mark Shepard analyze enrollees' willingness to pay for health insurance and the impact of subsidy rates on insurer costs. Commonwealth Care offers large subsidies for private health insurance for individuals below 300 percent of the federal poverty level who are not covered by an employer plan or another public program, such as Medicare. The researchers analyze data from fiscal year 2011. Insurance payments were covered by a combination of Commonwealth Care subsidies and premiums paid by the eligible individuals. Enrollee premiums, intended to be affordable for low-income people, varied with income levels. Specifically, rate changes occurred at 150 percent, 200 percent, and 250 percent of the poverty line. The premium for the cheapest plan was $39 a month for enrollees with incomes between 150 and 200 percent of the poverty line, $77 a month for those from 200 to 250 percent, and $116 a month for those above 250 percent. All of these enrollee premiums were heavily subsidized relative to insurers' costs, which averaged $359 per month. Individuals could choose to forgo coverage and pay a penalty equal to half the cost of the lowest premium. 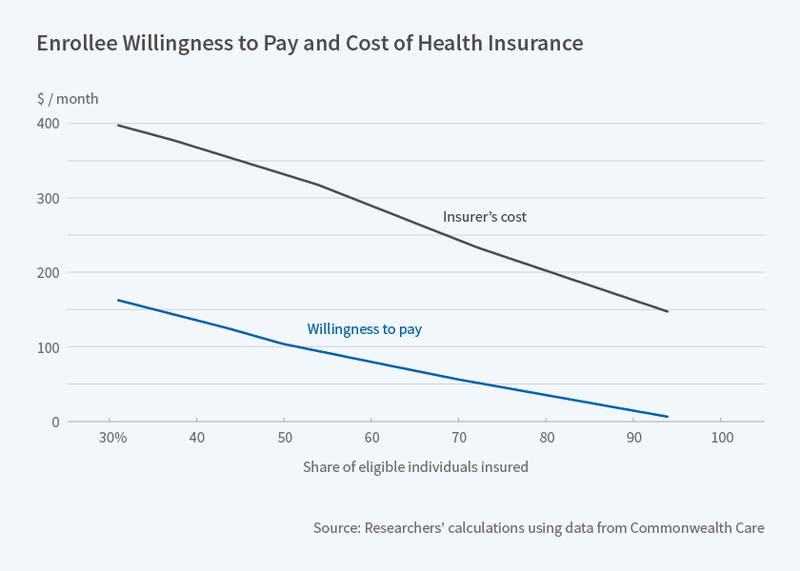 The variation in the post-subsidy cost of insurance for low-income participants allows the researchers to estimate enrollees' willingness to pay for health insurance. It also enables them to study how the set of enrollees who take up insurance affects provider costs. The researchers find that for each $40 increase in monthly premiums for the cheapest plan, enrollment in Commonwealth Care declined by about 25 percent, despite the penalty for opting out of coverage. When Commonwealth Care was free — as it was for those below 150 percent of the poverty line — 94 percent of eligible adults enrolled, but participation decreased to 70 percent when the premium rose to $39 per month, and to below 50 percent when premiums were $116 per month. As individuals dropped out of coverage when their premiums became more expensive, average insurer costs per participant rose. At the 150 percent threshold, insurer costs increased by $47 per enrollee, or 14 percent. This indicates that the individuals who dropped coverage as the price increased were, on average, less expensive individuals to insure. In other words, the insured pool was adversely selected in terms of health risk. The researchers estimate that individuals are willing to pay less than one-third of average insurer costs to obtain coverage. The median willingness to pay for insurance is $100 a month, roughly one-fourth of the cost of insuring individuals with above-median willingness to pay. Thus if a subsidy covers 75 percent of the cost of coverage, only half of eligible participants would choose to buy insurance. Even if the subsidy were 90 percent, 25 percent of those eligible would choose to remain uninsured. The researchers find that the gap between individuals' willingness to pay and insurer costs cannot be fully explained by adverse selection. They hypothesize that uncompensated medical care for uninsured patients accounts for the majority of the gap.